This year's annual MAHA Music Festival is history, so I figured I should get my two cents in on the event before it becomes ancient history, and talk turns to MAHA 2012. This year's festival was great, despite the mixed bag of a line-up, and the strange use of the "local" stage. I will explain what I mean later on. The weather was beautiful for the festival, and I really could not have asked for more. Well, actually, I could have, but it is doubtful I would have gotten anything different. Stinson Park at Aksarben Village was a great spot for the show. It was my first time to the area, and I liked it. The only drawback is that the park is so new that all of the trees are infants. There was literally no shade in the entire park. In 20 years, this won't be an issue, but in the meantime, bring sunscreen! Because the entire area is covered in grass, it is a better spot for sitting and watching the show than Lewis & Clark Landing where previous festivals were held (before the flooding). As I said before, the line-up was a mixed bag. I really don't like Matisyahu, and his inclusion on the bill changed the nature of the festival slightly. He definitely put some butts in the seats, as it were, but I doubt his fans were all that into folks like J. Mascis and Guided By Voices. There was a decent representation of local/regional talent at MAHA this year; but once again, the main stage spot given to a newer local/regional band is the worst time slot of the entire day. 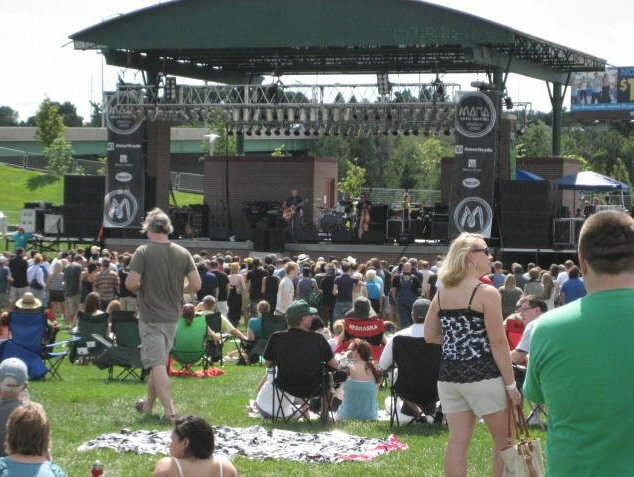 For example, Des Moines indie rockers, The Envy Corps, was given a main stage spot (like It's True had been the year before). They went on first with almost no one in attendance. Because the local stage was located just to the left of the main stage, and nothing runs concurrently, locals who played later in the day on the smaller stage, had a much better crowd. If given the choice between the main stage at 1 pm or the local stage at 5pm, the local stage is clearly the better deal. I wish there was some way to fix that and to make an early main stage spot better, but I'm not sure how they could avoid this issue next year, too. So, I missed The Envy Corps, and any locals who played before the second main stage act, Reverend Horton Heat, took the stage. I've never been a big fan of the Rev, so I hung back and scouted out the park while he played. Local band So-So Sailors played next on the side stage. SSS is the new band featuring Ladyfinger (ne) lead singer, Chris Machmuller. He really gets a chance to show his musical diversity and his vocal range in this band. They were good, and I will definitely be seeing them again. 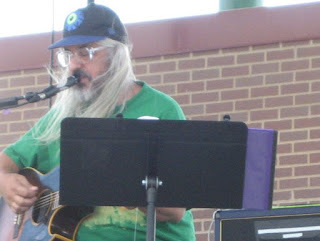 Indie rock legend J Mascis was up next on the main stage. No one seemed to know, for sure, whether the Dinosaur Jr. frontman was doing a "solo acoustic" or "solo electric" set. Turns out, it was a bit of both. J played sitting down with a music stand in front of him, and strumming an acoustic guitar. However, the acoustic guitar was plugged in with an electric rig which gave him the ability to switch between a more traditional acoustic sound, and one with distortion and effects. Mascis switched back and forth effortlessly. On many songs, he would start off acoustically, and with the help of some sort of digital delay, would loop his rhythm part, turn on the distortion, and rip an electric solo. It was just like having two guitar players up there. Mascis's set consisted of cuts from his newest solo record, Several Shades of Why, and many Dinosaur Jr. classics. "Get Me" was a highlight, as was his cover of "Friends" by Edie Brickell & New Bohemians. Despite my contention that artists should never sit down during a concert, I still really enjoyed J's set. After Mascis and another local on the side stage came Cursive. Living in Omaha, I am able to see Cursive more frequently than most. This show was special in that original drummer, Clint Schnase, returned just for this event. Still, I must admit that I hung back in the concession area and talked to friends during their set. It sounded great (and loud), but visually, I saw nothing. 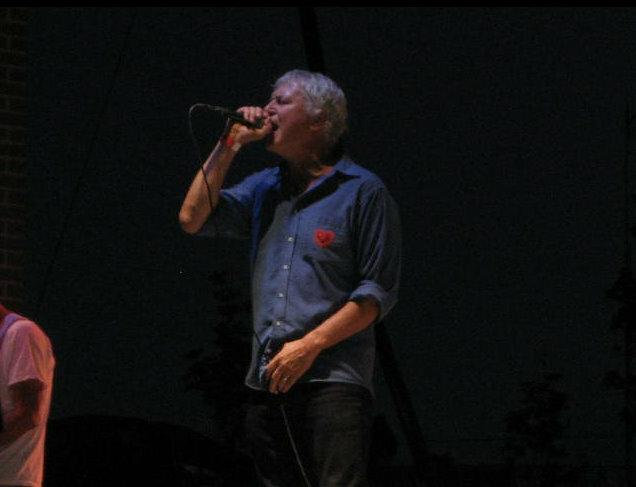 After a truly awful local jam band called Somasphere (I literally could not tell when one song ended and the next began), Guided By Voices was next up on the main stage. 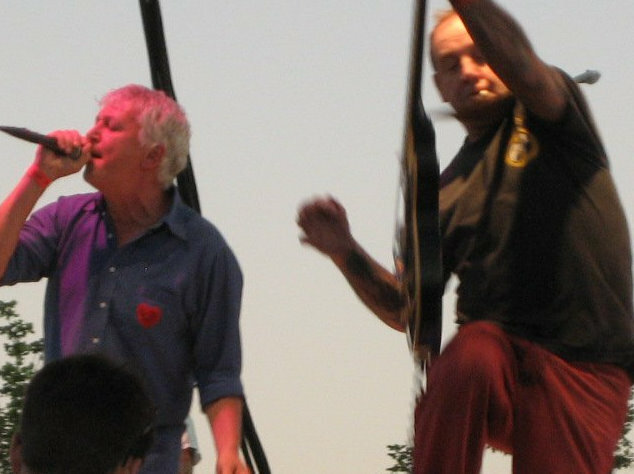 Though GBV was technically the headliner of the festival, they played before Matisyahu due to his unwillingness to play before sundown (in keeping with his religious beliefs). A decent sized core of obsessive GBV fans (myself included) lined up in front of the stage, anxiously awaiting the start of what was said to be the band's third-to-last ever performance. Robert Pollard and Mitch Mitchell rock out! GBV hit the stage around 8:15 or so, and the crowd went nuts when they walked out. For an older guy who used to be a 4th grade teacher, Robert Pollard has a serious swagger! The band ripped through hit after hit from their "classic" period (92-97), and rarely slowed down to take a breath. Pollard was a little light on the banter, but he did take time to mention how much he liked Omaha, and to welcome Nebraska into the Big Ten. 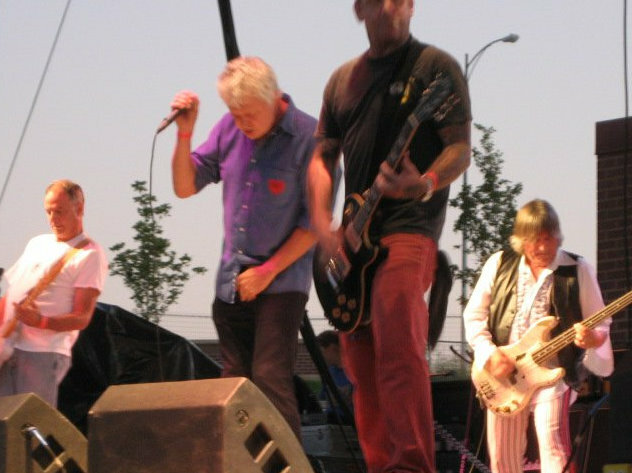 Guided By Voices played until the sun went down and had the crowd eating up every note. As the set went on, Pollard kept up his drinking and joked about the "scientist juice" (aka Tequila) he was drinking before the classic, "I Am a Scientist." Ultimately, the band played for a little over an hour. I would have liked more, of course, but there was a city imposed curfew of 11:00, and Matisyahu had yet to perform. After GBV's set, I quickly ran to the merch table to see if I could get some GBV gear. Sadly, there were nothing bigger than a "large" left, and it has been a little while since I could fit into something that size. Oh, well. I bailed before Matisyahu even began.